Slate green lentils, also known as French green lentils. They were originally grown in Puy, France in the volcanic soil there, but are now also grown in Italy and North America. They are known for their rich peppery flavor and ability to retain their firmness after being cooked. The puy lentils generally require more cooking time than other lentils. 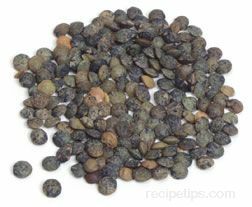 Beluga or brown lentils may be substituted but they do not hold there shaped as well as puy lentils.